It’s that time of year again, a time to whip out the old phone pics and bag a quick blog post. Its my eating highlights of 2017. As ever there has been some great feeds. I have merely chipped a few down that seem worth mentioning. I’m sure I know I will have missed a few out, but here goes…..
First up, one of my fave new places, ‘Friends of Ham’ in Leeds. A simple slice of pigs cheek on sourdough with a potato salad and a pint of hazelnut mild. Simple but delicious. I urge everyone to try. An unusual but rather splendid meal was had at a campsite in Conwy, North Wales. It was at ‘Signatures’. Despite catering for thirty odd people, a fine dining experience for just over thirty quid was enjoyed. Get your camping gear on chaps…..
One found oneself wholed up in Tenby, South Wales. A rather agreeable crab timbale and a fresh sea-trout at ‘The Plantagenet House’ by The Harbour worked wonders for the soul. recommended if you’re ever as far west in Wales as you can possibly get. A surprisingly decent crab salad with herbs and asparagus was had at ‘The Rose and Crown’, which was sadly a rather garish and unassuming gastropub in Fishguard. That said they have a chef who knows what he is doing. Simple exquisite. Ventured to old favourite ‘Baratxuri’ in Ramsbottom for a lunchtime snack, ended up sat in their new ‘comedor’ (dining room!) having a full chicken with all the trimmings! I’ve run out of superlatives for this place. You must go. I love a reuben! Manchester’s street food heroes ‘Northern Soul’ do a superb New Yorker. Cheese toasties on steroids. Seafood specialist and newcomer to Manchester ‘Randall and Aubin’ (reviewed here) provided a sumptuous array of oysters, crab and tuna for our wedding anniversary this year. Their twitter feed highlights many other delights. The fish and chips looks like a winner. Talking of fish and chips, we stumbled on ‘The Ferry Tavern’ in Penketh near Warrington. It’s all it does! It does it well though and a nice view of the Mersey gateway Bridge….. Took a colleague for a corking lunch in Manchesters Nothern Quarter. They have a new authentic mexican restauraunt called ‘El Taquero’. We loved it. Pork and pineapple taco anyone? 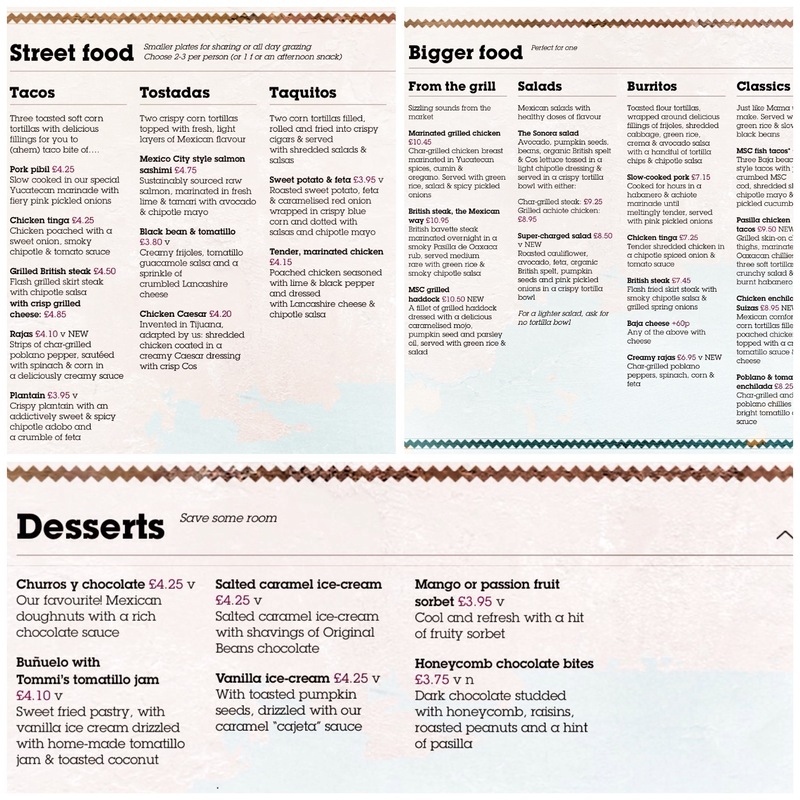 Say yes when asked…..
I’ve mentioned many times that you can press a pin blindfold onto a map of The Ribble Valley and you will find somewhere decent to eat. Came by accident across ‘The Aspinall Arms’ in Mitton near Whalley. Corking pigeon starter amongst. Trooped round Shoreditch on my own one Saturday. 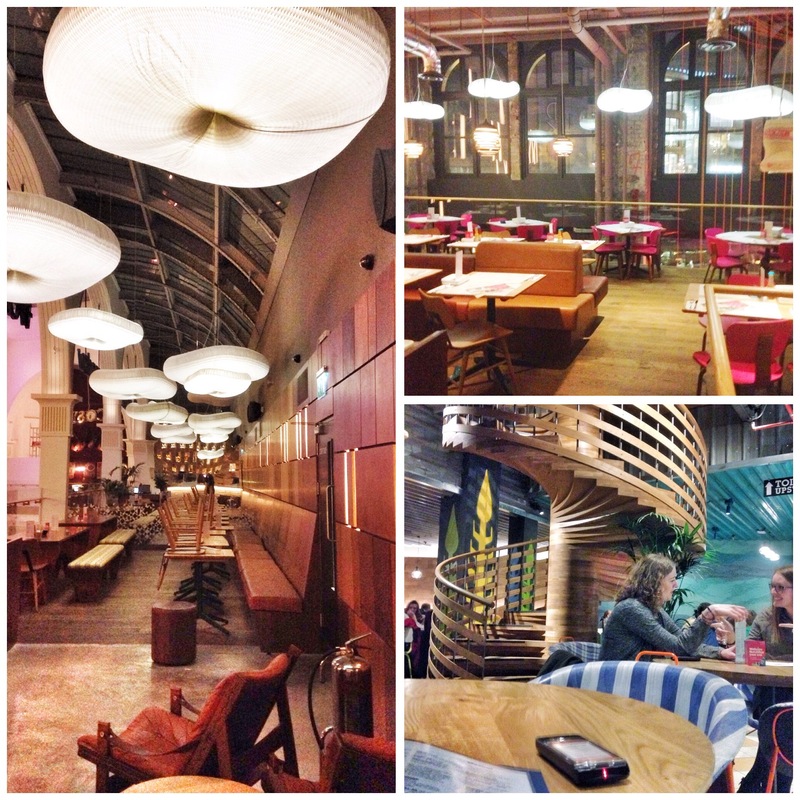 Fellow foodies pointed me to Smokestak. Unfortuantely I’d eaten but managed to squeeze these sticky pig tails in as a little snack. Will be back for a full feed one day. The Boys hit Dublin in a rainy January. away from Temple Bar we stumbled on Darkey Kellys. Best Guiness and a blimnding Guiness stew for a hearty lunch. Recommended. Finally and easily the best meal of the year for me. My birthday bash was spent at Simon Rogans’s Michelin starred L’Enclume. Stunning food in a fabulous setting with a glorious front of house. I need to go again and again. Review here. I should set the record straight here. I’m not a connoisseur on Mexican food. (It’s chilli con carne in it? 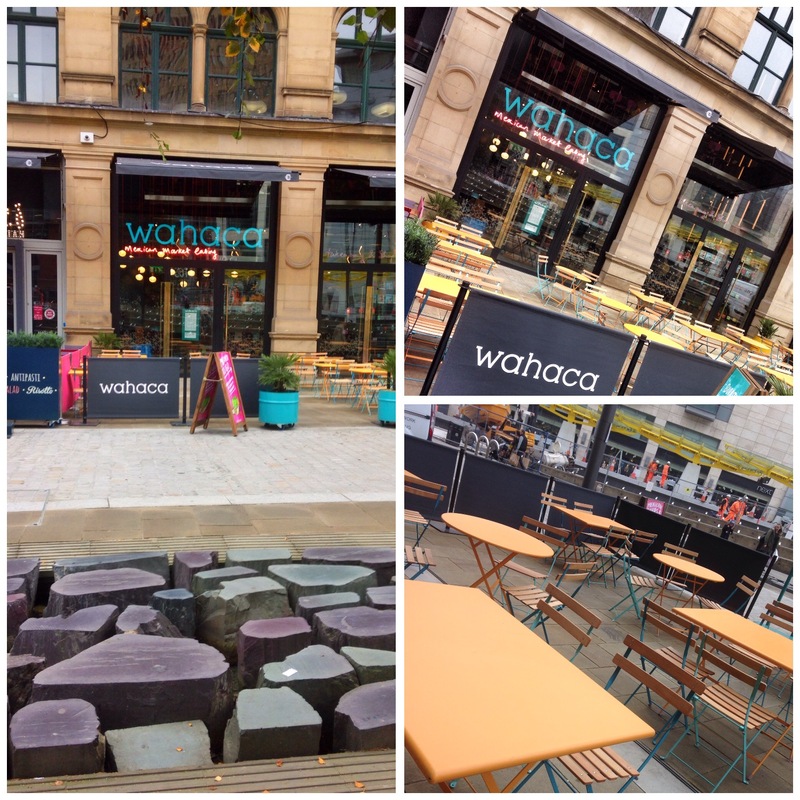 – Ed), but after keeping abreast of the hype surrounding this Northern launch of Wahaca, the excitement generated has been almost biblical. It’s one of the flagship signings for the Corn Exchange complex that has been transformed at the Victoria end of town. Accolades have flooded in from all corners, including a remarkable run of fifty odd five star reviews on Trip Advisor within minutes of opening! It’s been on the list ever since. And so it came to be. The Cooktwit was at a loose end. He had to fill an hour between work ending and the start of a triumphant Motley Crue gig at the nearby arena. 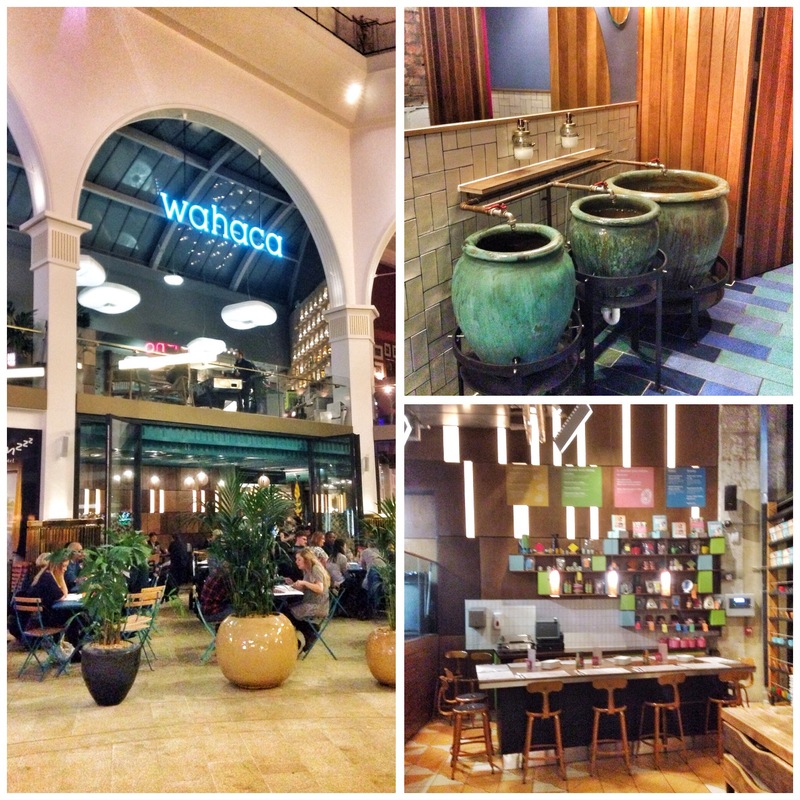 It seemed like the perfect opportunity to try out Wahaca. Working around the country as I do, I’m used to dining alone (awww – ed). Tonight was such a night. I ventured in from the front, it’s a smart welcoming entrance, colourful and loud. The pleasant front of house reckoned it would be twenty minutes for a table, even for one, on a Tuesday night at six! I was handed a bleeper and set up shop with a bottle of Corona. Within ten minutes I was whisked round the back to face the faceless atrium that is the ‘work in progress’ centre of the corn exchange. The place was rammed. Parties of mixed ages chattered loudly, families as well as business. 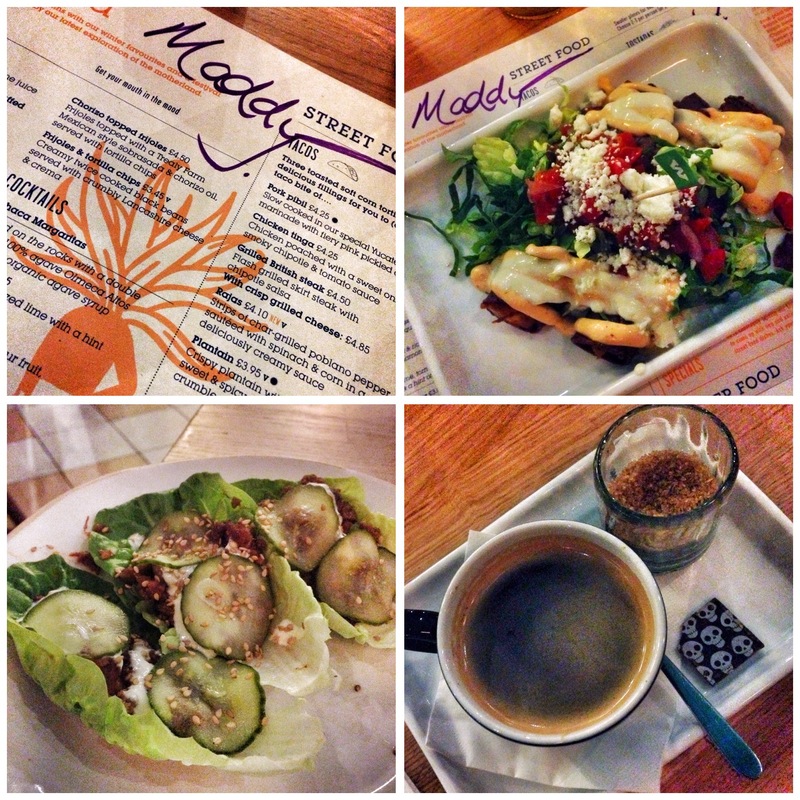 I settled in my table, beneath a metal mezzanine, upbeat tunes were banging forth, Maddy, my pleasant young waitress for the evening, explained the extensive, printed napkin come menu both verbally and by drawing all over it with a magic marker. She explained the cauliflower cheese was her favourite! I decide to go ‘street food’. It was recommended that three should be selected to satiate a frame of my size. It was also explained that the dishes would arrive as and when chef has prepared them. Sure enough mine all arrived together! First up Taquitos. 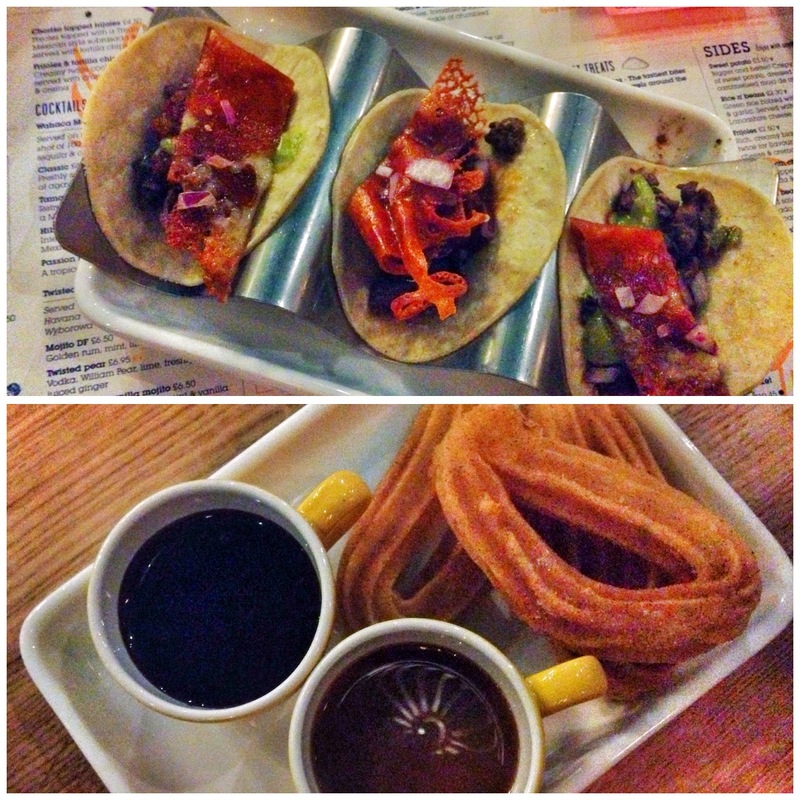 Two corn tortillas filled, rolled and fried into crispy cigars and served with shredded salads and salsas. I chose the Sweet potato and feta version (£3.95) which came with caramelised red onion and wrapped in crispy blue corn, dotted with salsas and chipotle mayo. It looked pretty good, very appetising, but my first venture into the plate with my selected utensil (a spoon) resulted in the whole thing exploding all over the plate, such was the crispiness of the cigar. When I eventually got a mouthful the temperature variance between the case (hot), the potato (warm) and the feta (cold) made for an unpleasant feeling on the palate. The flavours were good though. Some zing ventured forth from the various salsas but overall a little disappointing. I then had a special. I think they were called ‘piccadilos’. Basically this was three, spicy pork and beef minced patties wrapped in a lettuce leaf (£4.25). Again it was tasty enough but once again suffered from the variance in temperature. Cold lettuce with luke warm contents. Best of the three by some distance was the Beef Tacos. Three toasted soft corn tortillas filled with grilled British steak (£4.50), the beef was flash grilled skirt steak with a chipotle salsa. These were of even temperature and very good. I dotted some of the dishes with the chilli salsa and chilli sauce from the bottles supplied on the table. These added a welcome piquancy. Having downed the lager I ordered up a coffee and a dessert. My coffee came almost immediately. My dessert some fifteen minutes later! 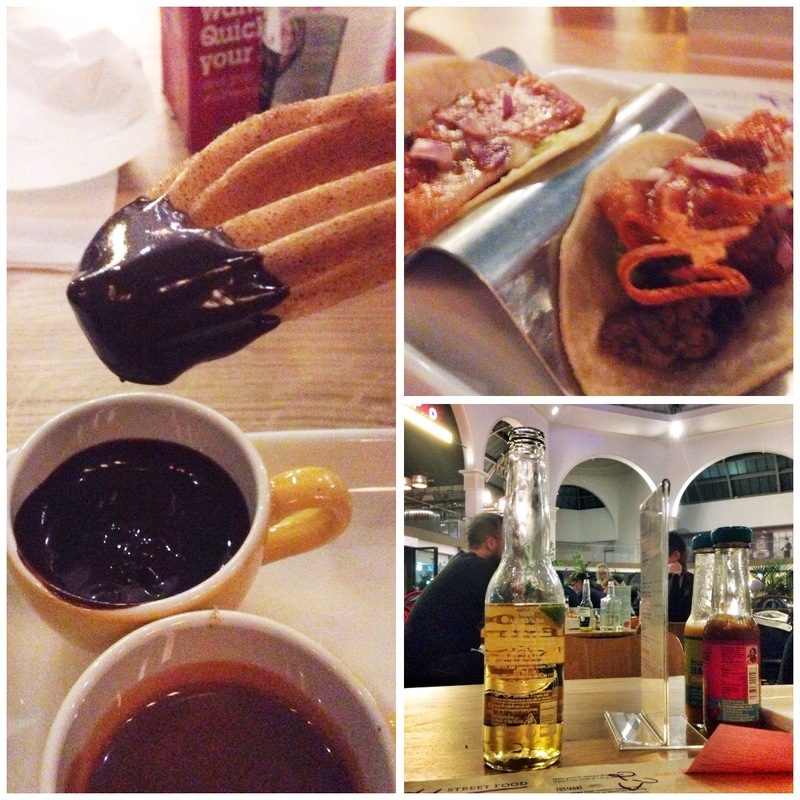 To be fair the coffee was very good, but dish of the night was the Churros y chocolate (£4.25) Mexican doughnuts with a rich chocolate sauce (although fortuitously I got caramel sauce as well). These were excellent, clearly fresh and hot. They were arguably the best Churros I’ve ever had. The caramel sauce in particular adding a major touch of indulgence. In conclusion the whole hour with drinks cost me £23. Pretty good value really. If I’m honest given the hype and my own expectations I left a little underwhelmed. It’s clearly a popular place. The service is bright and peppy. I reckon it’s more suited to a party night out. The first floor (which was shut tonight) looks pretty smart too. I reckon the view over the atrium would be good.